The heartbeat in Gage Hinsz's chest had always felt normal. There was never any reason for him to think it wasn't. That was until Pirates team physician Dr. Edward Snell conducted a routine physical prior to the 2015 season and discovered the organization's 19th-ranked prospect had a heart murmur. The 2014 11th-round Draft pick and the team were proactive following the diagnosis, with annual checkups to monitor the issue. Last year, the tests came back the same they had the previous two years. After Hinsz was involved in a car accident on March 28, doctors administered a CT scan, which also came back normal. His echocardiogram, though, revealed a leaking bicuspid aortic valve, a condition severe enough to warrant open heart surgery. Thump ... thump. Thump ... thump. The initial diagnosis of a heart murmur was sobering, sure, but Hinsz never thought he'd have to go under the knife weeks after his 22nd birthday. Looking back to last offseason, though, he has an explanation as to why he consistently felt fatigued following his training sessions. "Leading up to that Spring Training, I just thought I was really out of shape. So I kept training harder and harder," he said. "I just couldn't get to where I needed to be. I didn't realize there was actually something with my heart going on. So it was a good thing they caught it when they did. Otherwise, I probably would have been one of those people who wind up dead at a random time. I mean, I never would have complained about being tired." The timing disappointed Hinsz, who was ready to begin his third full season of professional baseball. A major operation obviously forced a change of plans. "As far as the surgery goes, I wasn't scared or anything by it. I just knew that it was something that needed to get done and I was willing to do anything that I could I guess just to stay healthy," he said. "[The surgery itself] wasn't a big shock or anything; I knew it was coming. It [happened] kind of fast." The right-hander, his family and the Pirates huddled to determine the best course of action. One key decision Hinsz faced was whether he'd opt for a procedure that allowed him to continue his career or undergo a different surgery that would end his dream. "I was ready to do that just because I know that life is more important than baseball," he said. "Being able to be there and be with family and friends, that's pretty much priority No. 1 for me." The Pirates organized a meeting with Dr. Lars Svensson at the Cleveland Clinic. "He's world-renowned, probably the best at what he does, and the Pirates are the reason I got set up with that," Hinsz said. "They helped out a ton with everything -- all the travel and making sure my family could be there, helping out with all the hotels and those types of expenses and things. And then, obviously, just being there for me and whatever I needed, they were there to help." At 6-foot-4 and 210 pounds, Hinsz is an imposing figure, but he's generally unassuming. Yet he grilled Svensson before deciding on the procedure that allowed him to continue playing baseball. "I figured, for surgery, that would probably be a good idea -- to make sure I had all my bases covered," Hinsz said. "I just gave him the ringer with all those [questions] and he was spot on, never hesitated or anything like that. My parents and some of the trainers had read up on him, but I just really needed to meet the guy and know that I could trust him. That's what it all came down to: trust." Svensson performed the successful operation on May 8. Hinsz spent one night in the intensive care unit and five nights total before returning to his hometown of Billings, Montana. The most painful part, he said, was dealing with the constant itchiness -- his chest was shaved before the procedure. Back home, Hinsz relied on his support group of family and friends. The recovery time also provided an opportunity to dive back into one of his favorite hobbies: working on old cars. In high school, the right-hander had a friend whose father was into restoring antique vehicles. One day, his friend said, "Hey, you should get an old car. That should be your first car." Hinsz agreed and it's become a labor of love. This time, the project of choice was his 1971 Plymouth Barracuda. "A couple of friends of mine were right there with me. They would work on the car for me, obviously," he said. "But it was nice to get out of the house and be doing something, taking my mind off of the surgery and not being able to actually do anything." Unable to lift anything heavier than 10 pounds, Hinsz found himself asking for help more than he liked. That was difficult for someone who enjoys being independent and helping others. The time off also offered room for reflection. "I definitely learned a lot, about myself and what baseball can do for people," he said. "It was obviously a big challenge after surgery because I didn't really know what that was going to look like, baseball-wise. I was just hoping that I'd be healthy again and lead a normal life, for the most part. Luckily, I was able to." 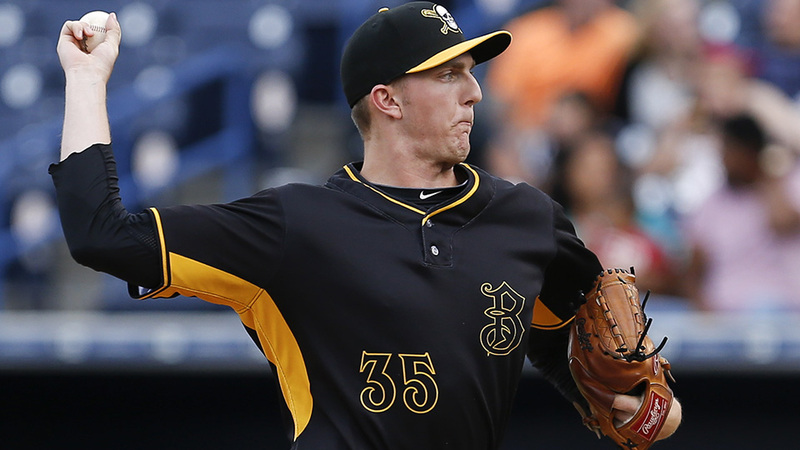 Hinsz returned to the Pirates' facility in Florida on June 12. He began with 30 minutes of training on the bicycle -- nice and slow -- and eventually picked up the intensity of his workouts over the next few months. That led to him throwing during the instructional league in Florida and then at Pittsburgh's academy in the Dominican Republic, where he pitched simulated games. By November, he was off to Puerto Rico to play winter ball for his first game action since the surgery. When Hinsz signed with the Pirates for some $100,000 above slot value out of Billings West High School, which does not have a baseball program, the club figured he'd take some time to develop. He made three appearances in the Rookie-level Gulf Coast League the year he was drafted and started the 2015 campaign with Rookie-level Bristol. There, he pitched 38 innings in 10 games, including nine starts, and posted a 3.79 ERA. He spent the following season with Class A West Virginia, where he was 6-8 with a 3.66 ERA in 17 starts. "He definitely has made awesome progress," Pirates director of player development Larry Broadway said. "Not only on the athletic side, but specifically -- just being from a small town, not being exposed to a lot of people and things going on -- just some of the early years, it was a very new environment from him. Just watching over a couple of years, his overall growth and maturity as a guy was just awesome. And that helped the transition on the field as well, just the overall confidence level and comfort level with being in this environment." The results stagnated in 2017, Hinsz's first season with Class A Advanced Bradenton. The adjustment to the Florida State League was a difficult one as opponents batted .296; a 5.61 ERA in 19 starts left a sour taste in his mouth. Eager to turn the page, Hinsz was met with the roadblock of the surgery that robbed him of 2018. Pittsburgh left him unprotected in the Rule 5 Draft this offseason, but he went unclaimed. And Broadway is excited to see how he bounces back in the Minor Leagues, although the team is prepared to err on the side of caution. "It's not like a Tommy John rehab, where you got to worry about the volume and repair on an arm," Broadway said. "But at the same time, we're not going to treat it like the year didn't happen and he threw 150 innings last year. So there will be a lot more art, some science in there, but just really seeing how he responds to the workload and try to allow him to get as much as he can get while still recovering well." And if Hinsz's 2019 campaign at all resembles the stretch he put together for the Carolina of the Puerto Rican Winter League, he'll be in good shape. Hinsz climbed a mound for the first time in 2018 on Nov. 17, when he struck out five over four scoreless innings and allowed one hit and one walk. He made five starts for for the Gigantes, giving up three earned runs over 25 innings (1.08 ERA) and posting zeros in four of those outings; he threw six scoreless innings in each of his final two starts and fanned eight in his last outing. Broadway watched one of the starts and saw someone pitching with confidence and determination. "It was really cool for him to just be able to go, jump right in and pick up where he left off. He looked good. He looked better than he left off," Broadway said. "And the stuff was good. He continued to take the ball and add innings and add pitches and recover well and compete well. [We're] very excited about where he was able to finish and where his potential is coming into Spring Training now." Puerto Rico was a learning experience, Hinsz said. He acclimated to a different pace of game and a different culture. "I just had goals in mind and after a life-changing experience, I don't want to hold anything back anymore," he said. "So it's nice to see that I'm able to go out and do that, kind of compete at a higher level than I had before. It was a big, big mental hurdle I'd been trying to get over the past several years in the Minor Leagues. It took having heart surgery to get over that. I'm happy it worked out the way it did so far." Montana is not known for being a hotbed for baseball talent. To be recognized, Hinsz relied mostly on American Legion ball. In the fall of his senior year, he was part of an area team that performed at showcases across the West. The group ventured to Colorado, Arizona and Washington, and Hinsz suspects that's how he landed on the collegiate recruiting circuit (he committed to Oregon State's powerhouse program) and on professional scouts' radar. Hinsz's primary pitch is a 60-grade fastball that can reach the mid-90s. In Puerto Rico, he felt he could throw as hard as ever. He's also added a sinker to his repertoire -- which includes a curveball and changeup -- and is excited to break it out during Spring Training. "He's a big workhorse-type body that has some power in his fastball," Broadway said. "He's got some good feel for a breaking ball and a changeup that's becoming a better pitch for him. It's got some sink to it. He's got the physical makings of a good starting pitcher." In terms of mechanics and stuff, Hinsz models himself after the late Roy Halladay. He's unsure where he'll begin this season but is excited about being around a team for a full season again. "We haven't really talked about it, as far as the Pirates and I," he said. "But that's my plan: get right back into it and try not to skip another beat, I guess." And without skipping any heartbeats, either.